NASA astronaut Anne McClain, attends her final exam at the Gagarin Cosmonauts' Training Centre outside Moscow on Nov. 14, 2018. 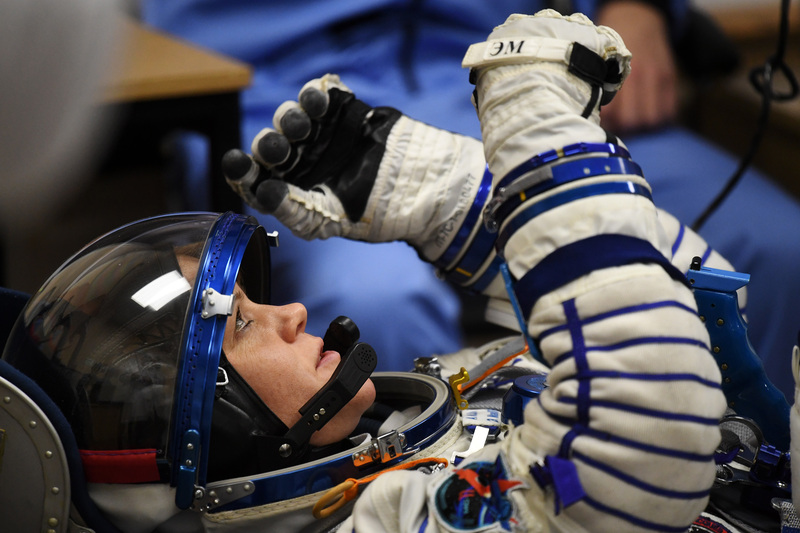 NASA astronaut Anne McClain reacts as her space suit is tested prior to the launch of the Soyuz MS-11 spacecraft on Dec. 3, 2018. 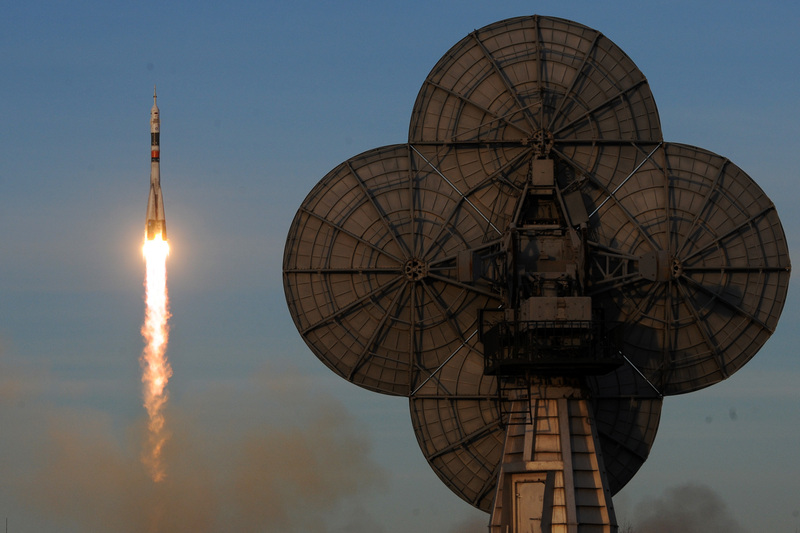 Russia's Soyuz MS-11 spacecraft carrying NASA astronaut Anne McClain blasts off on Dec. 3, 2018. This is Lulu's log, stardate February 17, 2019, where we discuss matters of space, the stars and the universe. GARCIA-NAVARRO: And today, we're actually going to take you out of this world and into space for an interview. UNIDENTIFIED PERSON #1: Station, this is Houston ACR. Please stand by for a voice check from NPR. GARCIA-NAVARRO: This interview is for all the grown-ups like me who once wanted to fly above the Earth and didn't make it and all the little kids today who want to try. UNIDENTIFIED STUDENT: It's all the way out in space. GARCIA-NAVARRO: Station, this is Lulu Garcia-Navarro at Georgetown Day School in Washington, D.C. Can you hear me? ANNE MCCLAIN: I hear you just fine. Good day to you. GARCIA-NAVARRO: Astronaut Anne McClain has been serving on the International Space Station since December, which is where she joined us from earlier this week via satellite. And here on Earth, we spoke to her from a pre-K and kindergarten class. And we chose that location for a reason, as we explained in our interview. GARCIA-NAVARRO: We wanted to talk to you from a classroom today because we read an interview with your mom, who said that according to family legend, you announced on your first day of preschool that you wanted to be an astronaut. Is that a true story? MCCLAIN: That is an absolutely true story. And, you know, you can't make it up. I told her that I was going to school to learn to be an astronaut. And that was my focus. And by the time I was 5 or 6 years old, I wrote a little book about flying to space on the Soyuz vehicle. So dreams and maybe even predictions do come true. GARCIA-NAVARRO: What was it like when you finally got into space after that lifelong dream? MCCLAIN: You know, it is such a profound experience in my life. I will probably spend the rest of my life trying to find the right words to describe it. And I think words almost do it injustice. It was this combination of complete awe of looking back at the planet and understanding the context in which I had lived for so long - it was suddenly gone. And I was in a completely different environment, totally reliant on so many thousands of people in the different space agencies to keep me safe. And then there was just the human side of me that was - it was the first time in my whole life that there was no doubt that I would get there because I was already there. I think up until the moment that you launch, so many of us are thinking, you know, there - maybe there's a reason. Something's going to happen. I'm not going to go. I'm going to have a medical issue. You know, they're going to delay the launch. But when you are finally in space and you're finally looking back at Earth and you realize for the first time in your life there's nothing standing between you and your dream, it's just so hard to describe the profound impact of that. GARCIA-NAVARRO: So can you tell us what you are seeing right now when you look outside the window? Where are you flying over? MCCLAIN: Well, since we started this interview, we have flown a quarter of the way around the world. We fly around the world 16 times a day. We have a sunrise and a sunset every 45 minutes. And by far, my favorite thing to see that I've been surprised at is watching the moon rises and moon sets that just move so fast. It's like it jumps off of the horizon and up and over us. And it's just my favorite thing to see. GARCIA-NAVARRO: So the class can see you on NASA TV right now. And they can see that, you know, you're floating. What's the coolest thing that you can do while you float? MCCLAIN: Well, I tell you what. There is - every day is a good day when you're floating. Your whole life you spend walking around Earth. And then all of a sudden, you get to fly like you've dreamed of. And we try to do all sorts of tricks. We try to see how far we can fly without hitting the walls. And sometimes, I just like to do some work upside down. You know, maybe I'll do the rest of the interview upside down just for the kids in the classroom. GARCIA-NAVARRO: And no surprise, the kids loved watching her talk with the darkness of space all around her. And they also had a few questions for Anne McClain. TESSA: My name's Tessa (ph). I'm 5. What do you eat? And what's your favorite food? MCCLAIN: Well, you know, if we sat down with a bowl of rice like we would on Earth - right? - all that rice would just rise off the plate. And so we eat everything out of pouches. And we have two types of pouches that we fly. One is what we call shelf-stabilized food, which is just - it's like a pouch that you open up and you can spoon out and start eating it. And so my favorite food - we have a great chicken with a peanut sauce that's really good. We have chicken fajitas that are really good. And then the other type of food that we fly up - or it's dried food. And so some of my favorites are the mushroom soup. And we have a great turkey tetrazzini. So we have a huge amount. I think we have over a hundred different kinds of food. So they try to keep it so we don't get too bored with the food up here. LULETE: My name is Lulete (ph). I'm 5. How do you sleep? Is it hard to sleep in space? MCCLAIN: That is different for everybody. So I sleep about six or seven hours a night here. I sleep a lot more than that on Earth. And I don't think it's because I'm uncomfortable. I think it's because when I kind of wake up in the morning, I'm so excited to be up and to be in space that I just want to start my day and get going. So sleeping is very - it's very interesting. You know, you kind of just float inside of your sleeping bag. And you attach your sleeping bag to the wall, otherwise you'd float around to the other side of the space station, or maybe one of my crewmates would play a joke on me and pull me out and move me somewhere else. So I attach myself to the wall. And then our arms kind of float up. So we look a little bit like zombies. GARCIA-NAVARRO: Do you have any message for your fans here back on Earth? MCCLAIN: Absolutely. I tell you what. You can do - you really can do anything that you put your mind to. And I knew I wanted to be an astronaut already when I was your age. And so the dreams that you have right now very well could be in your future. And the biggest thing is to not give up no matter what anybody tells you, no matter what circumstances are sent your way. No matter what happens, you stay focused on that goal. And if you stay focused on that goal, you can shape your life in that direction. GARCIA-NAVARRO: Class, we want to think astronaut Anne McClain joining us from the International Space Station. Everyone say thank you. GARCIA-NAVARRO: Anne McClain ended her interview by waving at these potential future astronauts while floating away upside down. (SOUNDBITE OF RUSS LIQUID'S "OPUS ONE") Transcript provided by NPR, Copyright NPR.